The man on the right was a very good friend of my Dad. He was a brilliant character actor named Johnny Seven, he was remembered for a lot of different rolls including his part of Lt. Carl Reese from Ironside. My favorite part he played though was in the movie The Apartment with Shirley MacLaine and Jack Lemon. 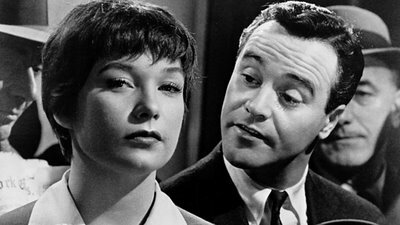 He played Karl Matuschka the brother in law of the poor elevator girl, Fran Kubelik (played by Shirley MacLaine.) I love the whole movie and everyone in it but my favorite scene in it was the Spaghetti Scene followed by the one where Karl punched C.C. Baxter, (played by Jack Lemon) not for the punch but for the stories Johnny regaled my brother and I about it. Johnny and my Dad were friends for a long time. We use to visit Johnny at his real estate office all the time and I was a tv nerd. I had seen old movies and tv shows ever since I could remember. So one day the adults were talking about adult stuff and I wandered around his office and looked at his pictures of movies. He had pictures from his Ironside days including a framed bill from Raymond Burr which is another blog. There was a picture of Johnny, Jack and Shirley in the scene just before Johnny slugged Jack. Johnny came up behind me and said, “That was quite a scene, Sweetheart.” I looked up at him, I was about 14years old at the time and said, “Oh yes, I remember it. You Slugged Jack Lemmon in the movie. Did his stuntman teach you how to do it?” You see I had read a lot about my chosen profession and I knew that the stuntman not only did the stunts but showed the actors how to do a part of if for close ups. That was my introduction to action on a set and how everyone on a set knows about it. And that things are not perfect with professionals like I had thought, that people make mistakes. (This was before bloopers on TV.) It was the first of many lessons I learned from Johnny.